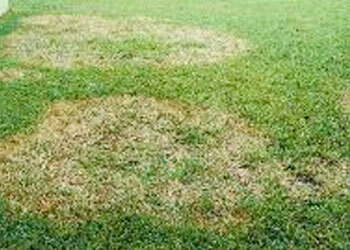 This disease is most likely to be observed from November through May when temperatures are below 80°F. It is normally not observed in the summer. Infection is triggered by rainfall, excessive irrigation, or extended periods of high humidity resulting in the leaves being continuously wet for 48 hours or more. The fungus infects the leaf area closest to the soil, eventually killing the leaf. A soft, dark rot occurs at the base of the leaf, and leaves can easily be pulled off the stem. The base of a pulled leaf has a rotted odor. Roots are not affected by this pathogen.